Well I am one month into my DCP Treatment so I thought I'd give a quick update into how it is going. The answer is- not at all! Basically with the treatment you get this stuff applied to your head that will cause an allergic reaction. Every week they increase the dosage of the treatment until you get the appropriate reaction (which, from what I have heard is a lot of uncomfortable itching). This week I am going in for my 5th week of treatment and I think this may be the time that I actually get a reaction, because the guy ahead of me got a bad one at this level and I heard him asking the doctor what to do if it gets bad again. JOY. It is really weird to HOPE to be uncomfortable and itchy. But if I don't get a reaction, what the heck is the point of missing work every week for this treatment? In other news, Tuesday happened to have been the 12 year anniversary of finding my first bald spot. It is crazy to think that it has been 12 whole years of having this disease. I often forget what it was like when I had hair. If I think really hard I can remember the feeling of a pony tail or braid in my hair...but really my reality has changed so much. A lot of people who know me recently might not know that I wasn't BORN with this. I had completely normal hair until Nov 27th 2000. I did nothing to start losing my hair. It just randomly happened and I have had to learn to adapt. You really can't stop life and feel sad just because something crappy happens to you. Because crappy things are always going to happen. Maybe it won't be your hair falling out. Maybe it is a bad financial decision, losing your job, getting sick. Who knows. "It is not the winds we control, but our sails"
I don't know who said that originally, but the words still ring true. You cannot change what happens, only how you react to it! So that is my random Thursday ramble and my random Thursday advice. Hopefully today when I leave work early to travel 1 hour on the TTC to my appointment, I will think less about the inconvenience and more about how lucky I am to be part of this trial, to have my health, to have amazing family and friends, and basically all the other wonderful things in my life. Thank you for this post today. I needed the reminder that bad things happening does not make life stop. Life will continue on and I can choose how to live that life. And thank you for sharing that quote. It is oh so true. I just found your blog last night via the Apartment Therapy website, and I have been working my way backwards reading it. I love your ideas and tips for organization and decorating, but it was this post in particular that really got me. 5 years ago I was diagnosed with Multiple Sclerosis (MS) and although I was very familiar with the disease already (I was dx a year AFTER I had left a job working for the National MS Society! ), I had a hard time accepting it. Over 60 months later, I'm still struggling to accept the dx, even though my health has been stable for the last 2 years. Your words about not being about to stop life, and appreciating the good things you have, is the outlook I'm working on having every day. The quote you shared is perfect, and it settles right into my heart. Thank you for sharing your personal story and this post. You're a beautiful, creative woman and I look forward to back reading all your posts and then reading each new one! Hi Haylah! So glad to have you stop by! I used to know someone with MS and it can be a terrible disease (but I dont claim to know too much about it). But all you can do is do your best to take care of yourself and focus on the positives. Am I 100% happy every day? heck no! 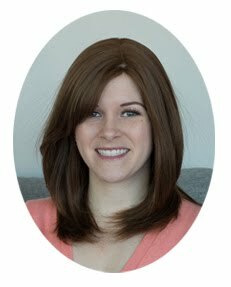 Do I get depressed sometimes about Alopecia (which is also an autoimmune disease, like MS)? Yup! Let yourself have your pity party when you need it and then work to get back to a better place. Dont be afraid to call someone just to cry for a bit :) Friends are what make life worth living!